Proofreader’s marks are my friends. Add those to the ownership of a red ball point pen, and you’ve got yourself an editor. 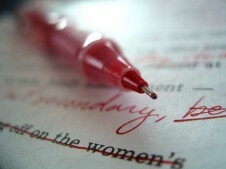 I love to edit writing, especially when the writing is good and simply needs a little magic mojo from my red pen. My students aren’t the only ones who “suffer” from my editing skills, but I edit my own writing as well. In fact, writing the first draft of an article isn’t my favorite part of writing, but let me have at it when there’s something on the page that needs to be reorganized, reworded, and rewritten. I love breathing life into it, so that when someone reads it, they might be changed for the better and hopefully forever. While reading a historical fiction novel this week, I came across a quote that jumped off the page: “No word should be uttered, much less written, without the benefit of an editor” (From a Distance, a novel by Tamara Alexander). I was drawn to it simply because I had always considered editing only the written word. Words that are uttered cannot be edited. Once spoken, they are forever there and can do immeasurable damage for years. Oh sure we can apologize for the things we say in anger, in stress, or in frustration–but they can never be deleted or replaced with a better choice of words, like the words on a page. A few years back, I taught my sweet youth girlies a motto: “Stop, think, and filter.” Implied was the fact that we must stop and think about what we want to say, filter it through the ordinances of God’s word, and then speak. In essence, we must become editors of our own speech. Let me give you an example…a few weeks ago, I was chatting with a friend, and she was telling of a recent event that occurred at work. A colleague flew off the handle and promptly insulted the group standing in front of him. The statements were clearly meant to belittle the people, and the friend was hurt and frustrated. At that moment, a thought came to my mind that would have justified my friend’s feelings and put the “mean person” in a bad light. Within nanoseconds, the comment was standing on my tongue ready to be delivered to the forever world of spoken words. Suddenly, I felt the sting of those words had they been unfurled: the pain they would have caused the “mean person” if he heard them, and finally the truth that I would only be saying then simply to hurt! I stood and filtered and forced myself not to give life to those words. I wish I could say it was easy–but it wasn’t. I had to edit myself three or four times in a 5 minute period just to keep that one comment from being uttered. Editors are usually someone very familiar with a writer’s writing and know them well enough to make changes that will benefit and create even more perfect prose. However, there is no one to edit our spoken words but ourselves. Sure we can filter our thoughts before they become words, but ultimately we speak what we speak! (Profound statement, I know.) This is not easy. James 3:2 says, “Indeed, we all make many mistakes. For if we could control our tongues, we would be perfect and could also control ourselves in every other way.” Wow! When I first became a teacher, I wasn’t a talented editor, but after years of practice, I’ve gotten pretty good at it. I assume this would be true of my spoken word editing as well – the more I practice, the better I will become. If they only made red pens that could mark up pre-spoken words, I would be set! This entry was posted in Uncategorized on August 31, 2010 by aliciachall28.